We almost had a full week of perfect weather. Almost. Every moment spent hanging outdoors and drinking up the warmth of the sun is a good one. There is just never enough summer, especially since come Monday I will undoubtedly see half a dozen posts on fall fashion popping up in my feed. My continual wish to delay that, at least until September is never granted. As a society we always seem to fixated on what is to come next...before you know it holiday things will be out, and no I don't mean halloween. I know you fall lovers might be rejoicing, but as for me, and the other summer lovers out there, let's make the most of August and keep thoughts of flannel and faux fur at bay. Aw such a pretty dress! Perfect for the summer! Amazing bag and combination indeed! Even though I cannot wait for fall to arrive, I know how much you love summer and I hope the last weeks of it are amazingly perfect weather-wise for you. That would also mean that you have more opportunities to wear that adorable dress, and that can't possibly be a bad thing. 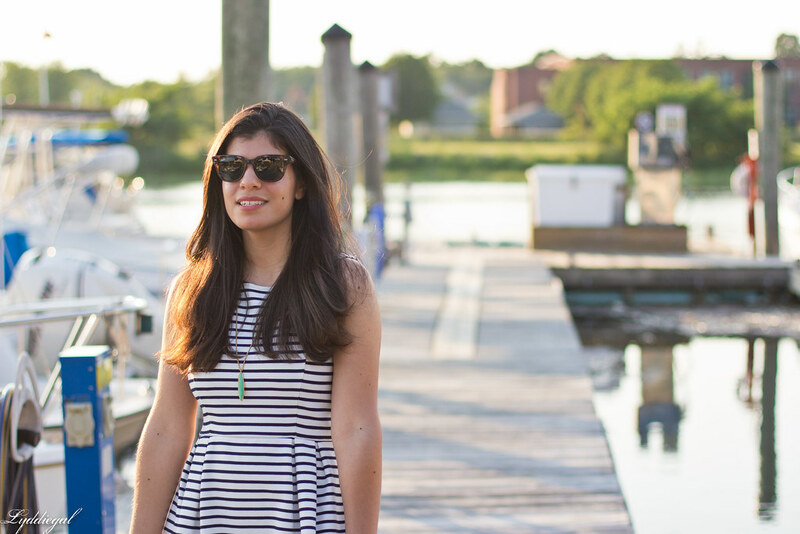 Super fun summer look Lydia! Have a great weekend. As you are well aware, this location is one of my favourites. 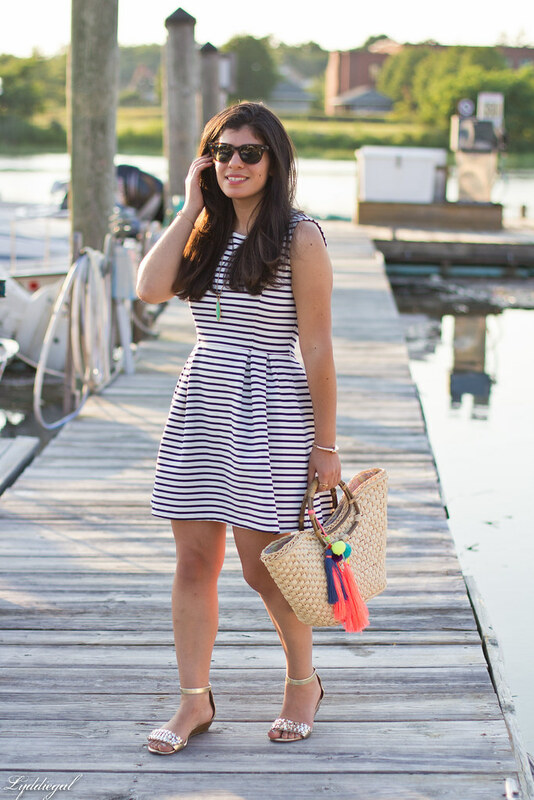 Great look - a striped dress, sandals and a straw bag definitely scream SUMMER. I'm totally with you! And all of the pumpkin!!! Gah!!! Too much! 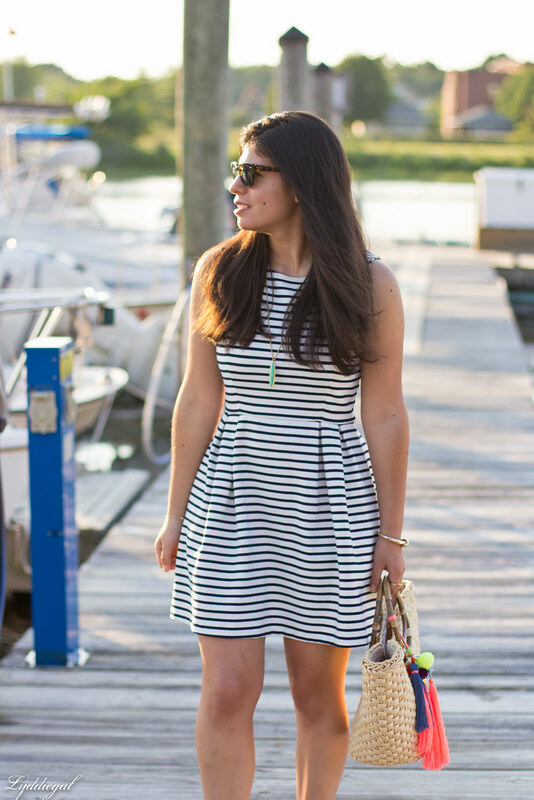 Love this bag and the striped dress! 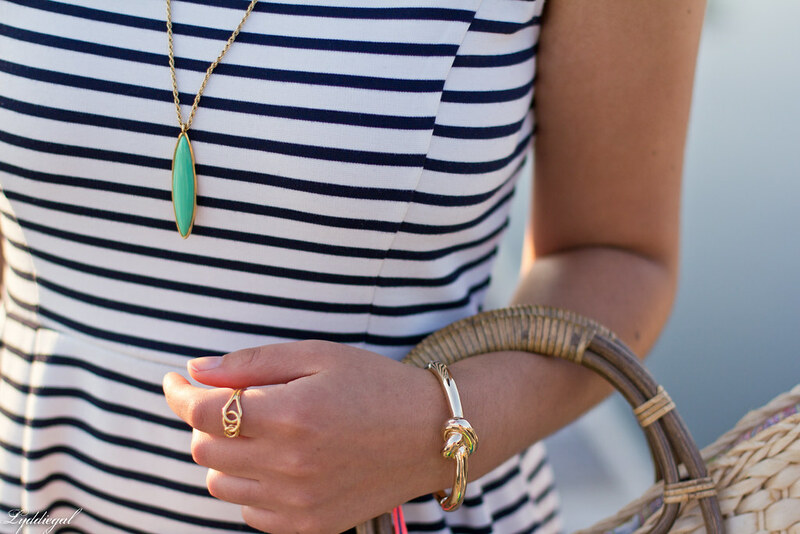 Can't get enough stripes! Love this dress on you! Gorgeous! Right now I'm not ready for fall but I think as soon as I start seeing those fall wish lists I'll be ready for cooler weather! I just love layers! Unfortunately, California doesn't usually let me and it pretty much feels like summer during the fall season. Maybe we should switch states? 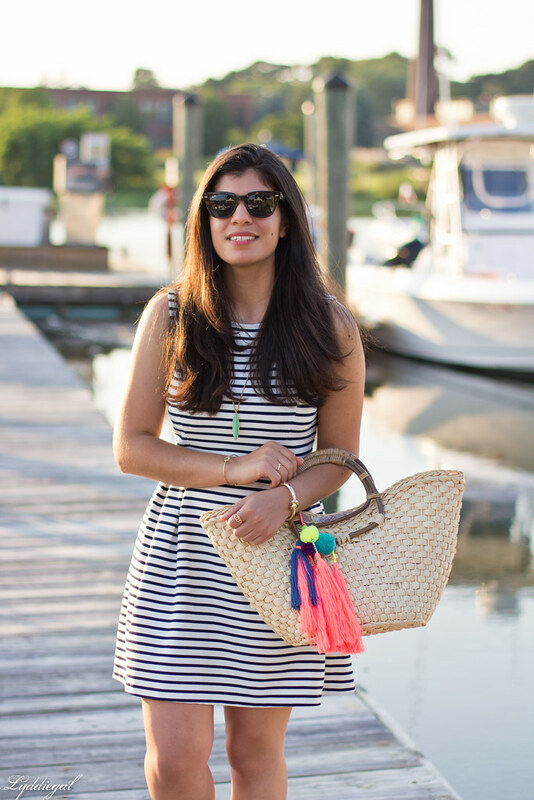 I love the colorful little pom poms on your purse! So cute, especially against the black and white stripes. 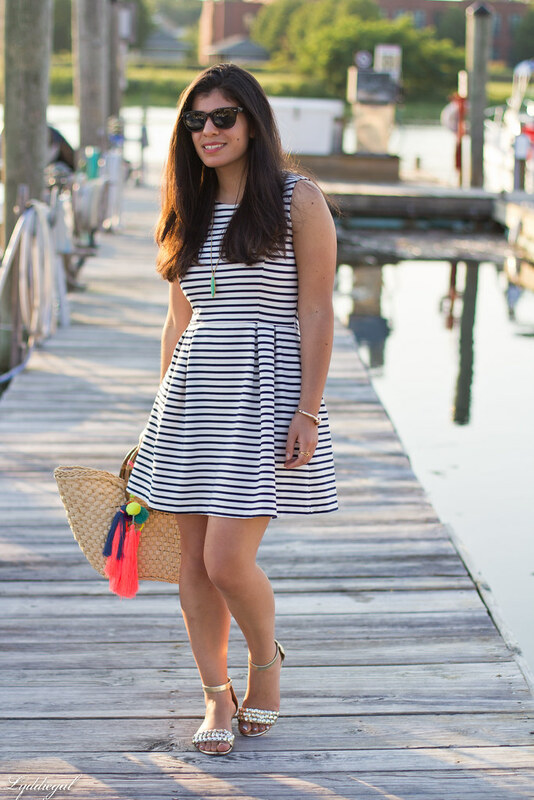 This is such a pretty summer dress! But I'm a total fall lover :) But I think it's because I live in Northern California where it's 110 degrees in the summer and our fall and winter is very mild. If I lived where you do, I'd probably want to hold on to summer as long as possible. What a darling dress! Super flattering on you! 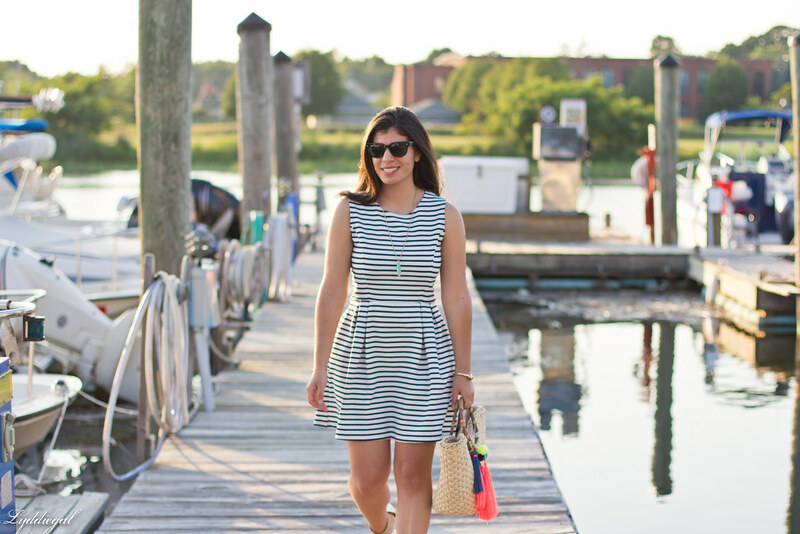 Striped dresses are so versatile! Your bright accessories really summerize the look! And summer is definitely one season I want to enjoy as long as possible! I am not looking forward to cooler weather! Very pretty look! Great dress! What a wonderful dress you are wearing! 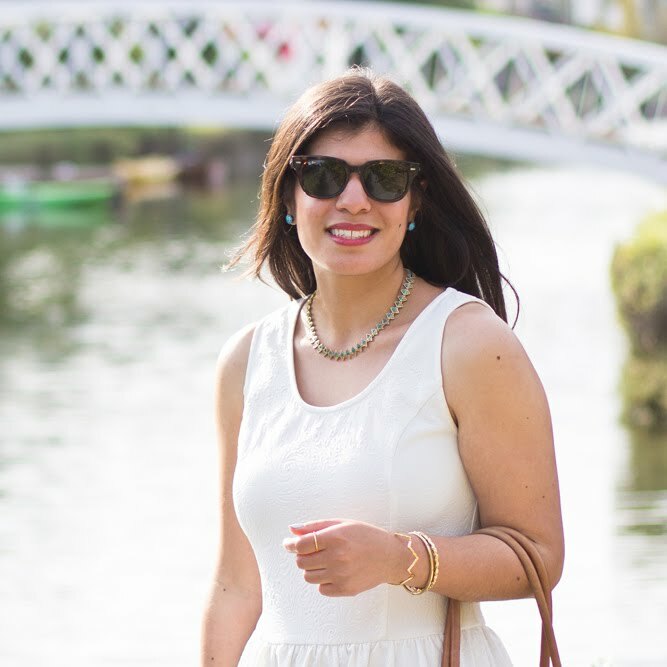 I love the dress- it's so fitting for the summer weather! So glad I stumbled on your site today! I love your photos, so beautiful. 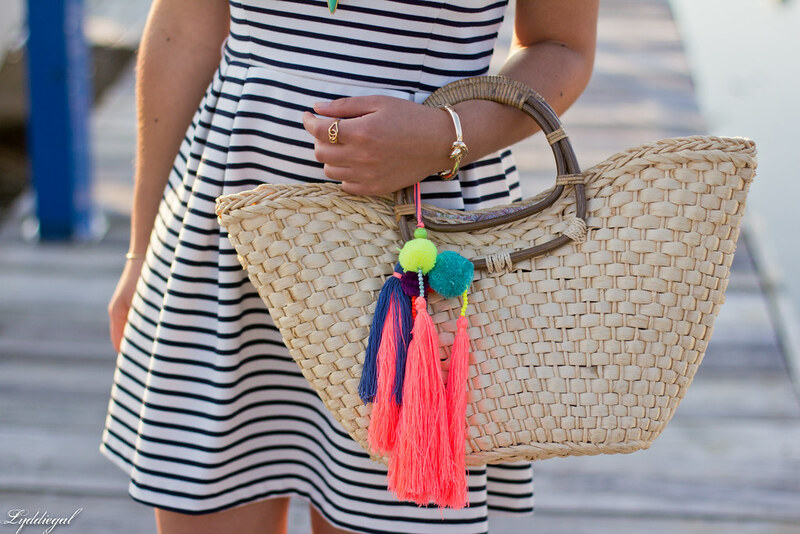 Im obsessed with your totes tassels! I can't believe that dress is from F21. Love this look...especially that straw tote! in love with your dress dear! 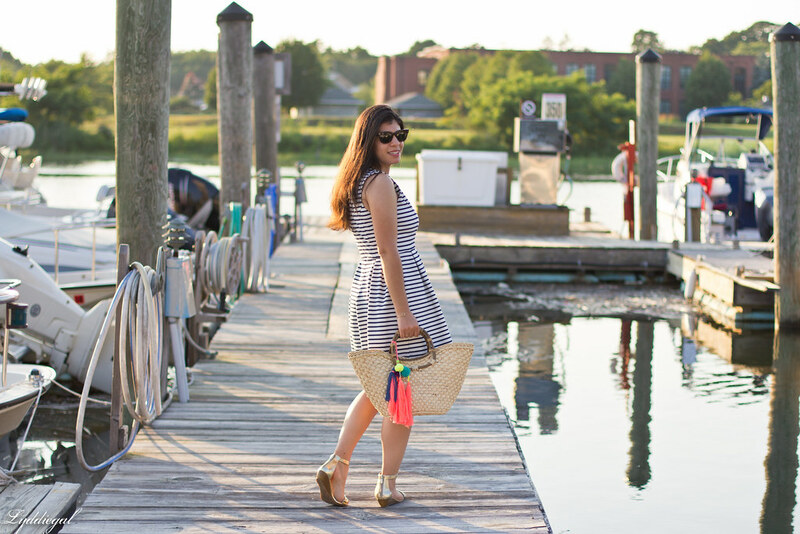 That tote looks amazing and fits right in with the sassy little dress:) Happy start to the week, lovely. I love your dress! It's so fun and perfect for summer! I'm not ready for autumn yet either, I can't believe it's already August! Love your classic striped dress though.